Along the Walk of Fame in Hollywood, teams must use a provided Polaroid camera to take pictures with three movie characters played by Australian-born actors. Daniel & Ryan get lost in the maze of Los Angeles freeways allowing Ashleigh & Jarrod and Sally & Tyson to start searching Hollywood Blvd. Both teams take pictures with the Hulk (played by Eric Bana), Wolverine (played by Hugh Jackman) and Thor (played by Chris Hemsworth). With Tyson unsure about Thor, Ashleigh & Jarrod gain the lead as they head to Ray’s Photolab to get their photos checked. Ray approves and he hands them the next clue pointing them to Pink’s Hot Dogs where they must each eat one of Pink’s famous hot dogs. After Tyson takes a pee break behind a dumpster, they get to Ray’s and receive the next clue. But before they leave, they go back inside to get directions to Pink’s as well as ask the guy at the counter to point Daniel & Ryan the wrong way. They give him a $20 tip. 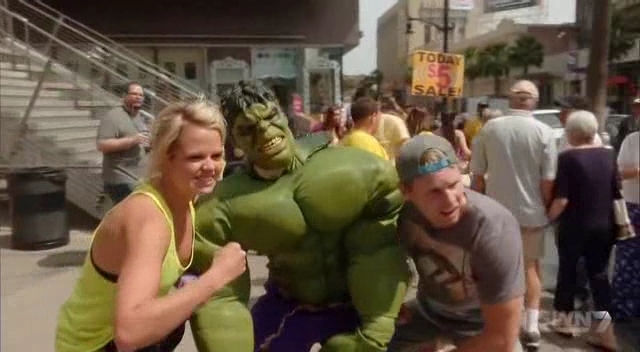 Daniel & Ryan take pictures with the Hulk and Thor before seeing a Sandy (played by Olivia Newton John). They head to Ray’s who gives them the thumbs down. They go back to Hollywood Blvd and try to figure out which one of their characters is wrong. After a quick Google, they see Olivia Newton John was actually born in the UK, so they instead find Crocodile Dundee (played by Paul Hogan) and return to Ray’s. At Pink’s, Ashleigh & Jarrod are given two Pink’s mustard onion chili cheese dog. And Jarrod thinks it’s horrible and disgusting. He doesn’t like too many things on his hot dog. While he suffers through it, Sally & Tyson arrive and shovel the hot dogs down. Sally actually finishes first even though she’s a vegetarian. 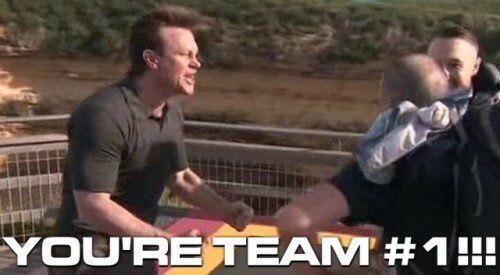 Ashleigh tries to get Jarrod to hurry up as Sally & Tyson leave. The patrons of Pink’s watch as Ashleigh and Jarrod start arguing. Outside Pink’s, Sally & Tyson open the next clue telling them to fly to Melbourne, Australia. All teams are on the same Virgin Australia flight from Los Angeles to Melbourne via Sydney. Before boarding, the teams are surprised to get called to the gate. But it’s good news. They are being upgraded to business class seats for their flight! While enjoying their premium seats, the flight attendant hands them a clue! It’s a little bonus game for them. 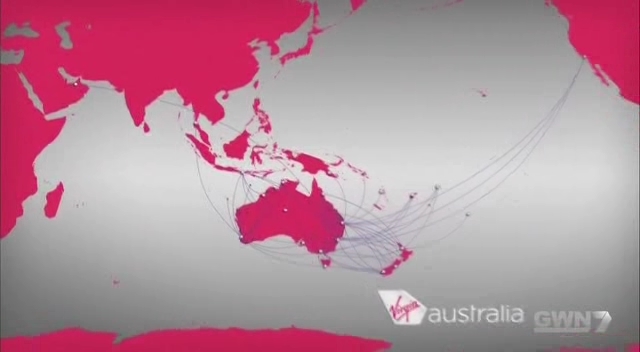 Using a provided map, teams must name as many destinations on the Virgin Australia network as they know. The winners will get two round trip business class tickets to Los Angeles. A few minutes after all teams have submitted their answers, Daniel & Ryan are congratulated as the winners. But it’s time for the real competition as they arrive in Melbourne. Teams must make their way to Moorabbin Airport. Ashleigh & Jarrod are excited to be in their hometown. They even know exactly how to go to Moorabbin. 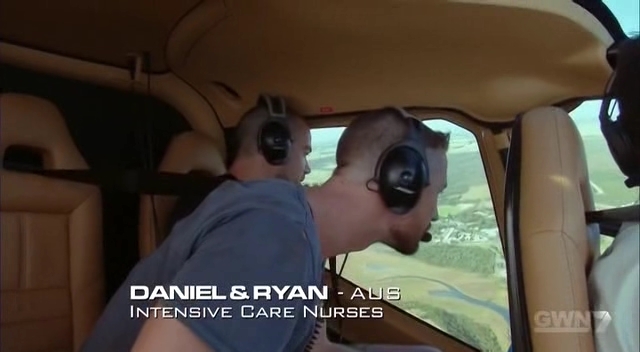 Daniel & Ryan’s taxi driver decides to take them another way and the other two teams hope the nurses have gone sightseeing again. But it turns out Daniel & Ryan’s driver got them the shortcut. They arrive at the airport and receive the next clue telling teams to take a helicopter to the Otway Rangers in Southern Victoria. 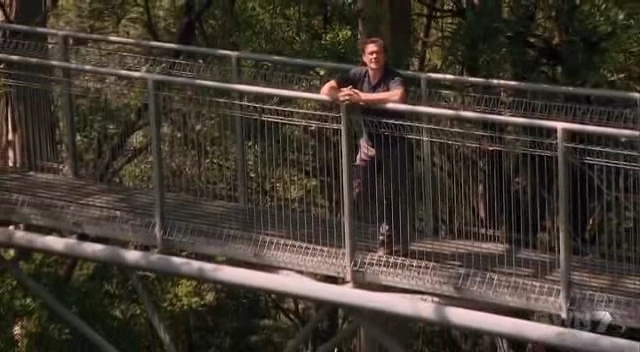 There, they will search the 600 meter canopy Otway Fly Walkway for the next clue. Ashleigh & Jarrod arrive next with Sally & Tyson in 3rd for the moment. 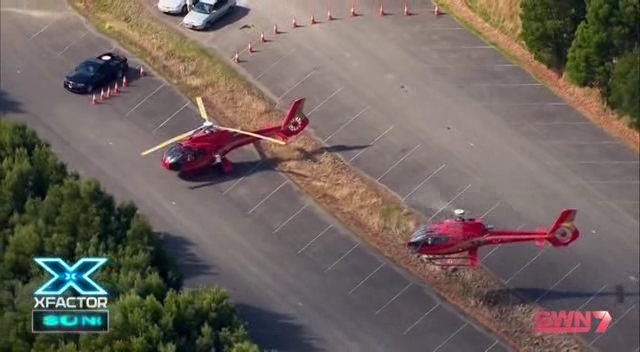 When the helicopter touches down, Tyson decides to pee right next to it before they run off. The next clue tells teams to hop back into their helicopters to fly to the Great Ocean Road near the Twelve Apostles. There, teams will scour the rugged coastline by air, land and sea for three pieces of a puzzle. 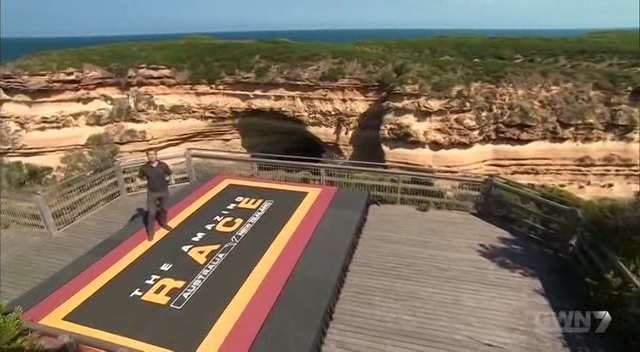 By air, teams must search the area around Port Campbell for a clue. 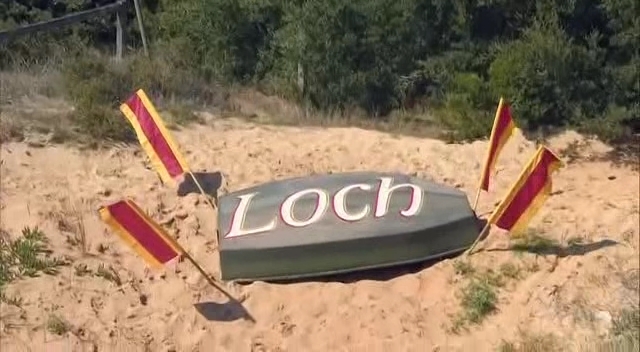 What they don’t know is that the clue is the word, LOCH, surrounded by four Race flags. Once they found it, they must return to land and give the correct word to the fisherman who will hand them the first piece of the puzzle. 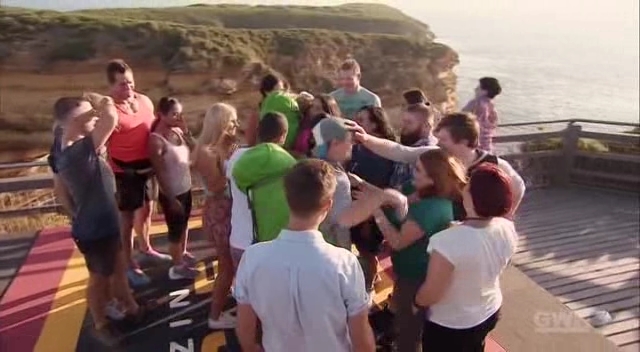 Before leaving, Jarrod asks the tourists to point Sally & Tyson the wrong way. And they do, pointing them all the way up to the top of a tower before they are pointed back down. Back up in the copters, Daniel & Ryan and Sally & Tyson have both found the “LOCH” clue. But Jarrod struggles to even see through the binoculars. After teams obtain the first piece from the fisherman, they must now make their way on foot to Port Campbell Beach. The 2nd piece, on land is a stopwatch hidden in a sandcastle. The 3rd piece is tied to marked buoy in the sea. They will then show all three pieces to the lifeguard to receive their next clue. 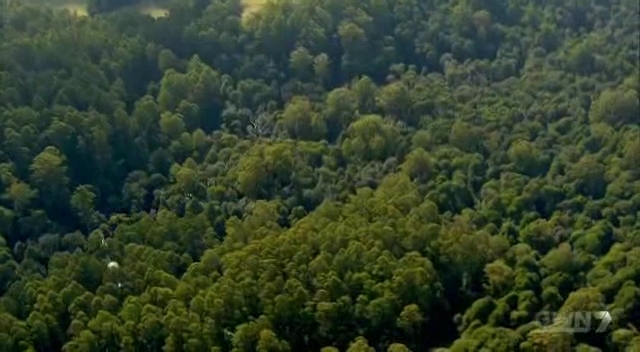 Back up in the air, Ashleigh & Jarrod have gone around in circles a couple of times already. They’ve found the clue, but Jarrod absolutely cannot bloody see what it says. His frustration reaches a boiling point until Ashleigh confirms what the word says. Daniel & Ryan start digging through the sandcastle and find the clue before they take their shirts off and head into the water. Jarrod’s frustration only reignites when he sees Daniel & Ryan with their shirts off on the beach below. Ashleigh asks him to please stop swearing. 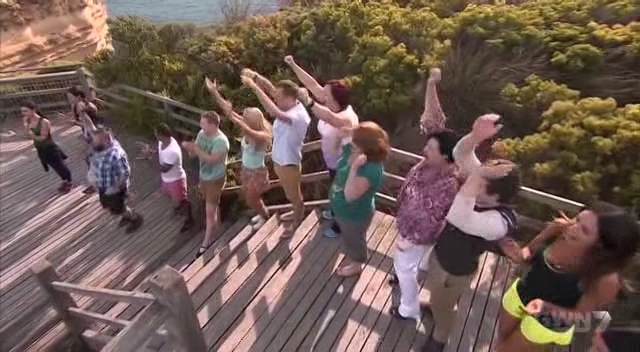 Ashleigh & Jarrod dive into the castle as Daniel & Ryan present their pieces to receive the next clue. The three pieces they’ve retrieved spell out their next location: Loch Ard Gorge. Daniel & Ryan and Sally & Tyson head to the next Route Marker, leaving Ashleigh and a continually frustrated Jarrod digging through a now completely flattened sandcastle. 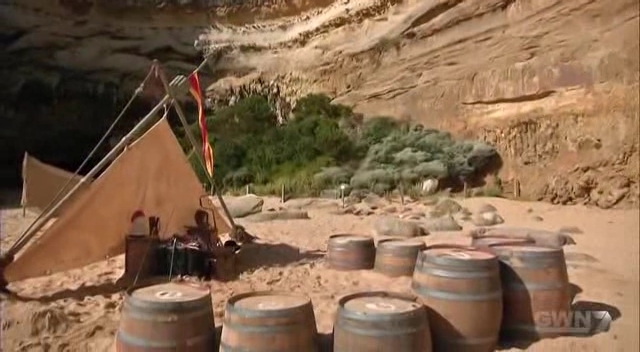 Ashleigh says Jarrod shouldn’t have flattened it out so much since the other castles are only 1/3 gone. Daniel & Ryan’s bad taxi luck continues when they miss the turn to the Gorge. That allows Sally & Tyson to arrive first and they find the Final Road Block. For this Road Block, teams must match items associated with each of the 9 Pit Stop Greeters they’ve encountered on the Race. After they’ve placed the nine items in the correct order on the corresponding barrel, they will receive their next clue. Sally decides to do the Road Block and gets off to a fast start. But Daniel & Ryan arrive and Ryan decides to do it. Sally says she is having most trouble with the Pit Stop in Russia where she and Tyson got engaged. She asks for inspection, but only gets 6 out of 9. 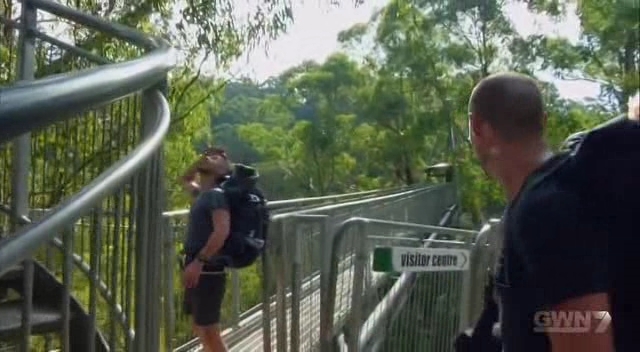 Ashleigh & Jarrod arrive and Jarrod agrees to do it. But he doesn’t remember anything. He gives it a try, but after inspection, he only gets 4 out of 9. Sally asks for another inspection and now she gets 7 out of 9. She switches something and now has 8 out of 9, as does Ryan. But now Ryan switches out a hat for boots for the New Zealand Pit Stop and he gets the thumbs up. They open the next clue and it tells them to run to the Finish Line, the Mutton Bird Island Lookout. Sally quickly gets the approval and she tearily reads the next clue with Tyson. 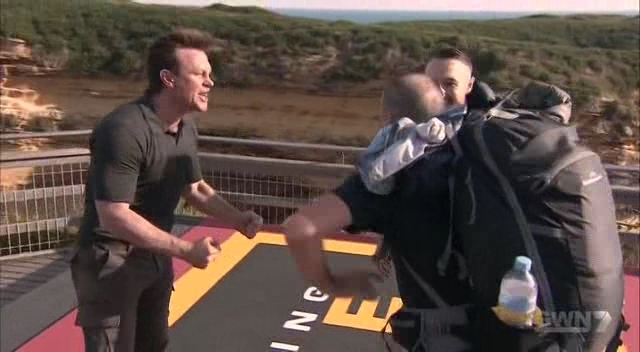 Daniel & Ryan have officially won the first ever Amazing Race Australia vs New Zealand. Sally & Tyson come running in and Grant officially checks them in as Team #2. Grant gives them some good news though. 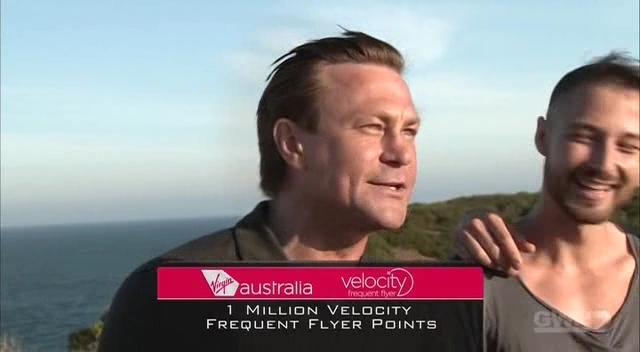 For making it to the Final Leg, the 2nd and 3rd place teams will receive 1,000,000 Velocity Frequent Flyer Points thanks to Virgin Australia. This is enough points to go around the world three times. Nice quote to close out this season eh? But let’s talk about just this episode first. I thought the Leg itself was kinda weird. I’m not so much a fan of the two-country Final Legs. One thing visiting Los Angeles was it allowed TARAu to say they visited 10 countries in 10 Legs. Which is awesome. And it is great to see more foreign TARs actually Racing and visiting the US. But by having even a few tasks in another country before the final destination, it removes tasks from that final destination with means less opportunity for teams to move ahead or fall behind. The Air, Land and Sea task in Melbourne was actually pretty good, but I wish there were one or two more tasks before it IN Melbourne instead of LA. Also, Grant does the BEST Finish Line announcements. Loved Virgin Australia giving those million points to Sally & Tyson and Ashleigh & Jarrod. That is almost as good a prize as the cash. I was totally rooting for Sally & Tyson and they almost had it too. So close. I actually started tearing up with Sally started crying after finishing the Road Block. They’ve really come a long way since that near-disastrous first Leg.